And so Bleeck Week begins. What is Bleeck Week, I hear you cry? Good question. I can tell you're the sharp, inquisitive type. 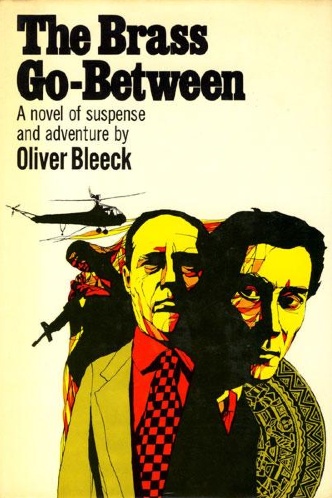 Bleeck Week is, or rather will be, a run of posts on the series of novels written by Oliver Bleeck, otherwise known as political/spy/thriller author Ross Thomas. Thomas wrote five books as Bleeck, which were as follows: The Brass Go-Between (1969); The Procane Chronicle (1971); Protocol for a Kidnapping (also 1971; there's some debate as to which of those two came first); The Highbinders (1974); and No Questions Asked (1976). All are written in the first-person and star urbane facilitator Philip St. Ives – the "go-between" of the first novel's title – whose job it is to act as intermediary between thieves who've stolen certain property and owners who want that property returned. I've blogged about Ross Thomas multiple times since Book Glutton tipped me off about him, most notably during the run of posts in November last year known rather prosaically as Ross Thomas Week; if you want to learn more about Thomas before embarking on Bleeck Week, go brush up on him here, here, here, and here. Suffice to say he was a master of sophisticated thrillers, usually with a political or espionage bent and peopled with quirky, memorable characters (often with off-piste monikers). And from what I've read thus far – I've only got The Brass Go-Between under my belt on the Bleeck side of the ledger (I'm doing rather better on the main Thomas backlist) – Philip St. Ives is up there with his best. The Brass Go-Between sees St. Ives undertake to act as intermediary between the Coulter Museum in Washington, DC, and the thieves who've stolen a priceless brass shield from said institution. Of course, matters aren't that straightforward: the shield is claimed by two African nations, Jandola and Komporeen, the latter of whom have agents at large in America attempting to retrieve the shield themselves, led by one Conception Mbwato. And mixed in amongst all that are reclusive billionaire oilman and chairman of the Coulter Museum, Winfield Spencer; Coulter director Mrs. Frances Wingo; a corrupt cop acquaintance of St. Ives's, Lieutenant Kenneth Ogden; two more cops from Washington, Demeter and Fastnaught; and the thieves themselves, who turn out to be somewhat incompetent. But it's St. Ives who's the real draw. A former newspaper columnist whose newspaper folded four years ago, St. Ives fell into the go-between racket at the behest of his lawyer, Myron Greene, and soon became trusted by all sides – the insurance companies, the police and the criminals. With nothing better to do and with alimony payments to keep up, St. Ives takes on five or six jobs a year and spends the rest of his time playing cards with his largely disreputable associates and lounging about his hotel apartment watching telly whilst eating cucumber sandwiches. Of all the Thomas characters I've come across, I guess he's closest to Mac McCorkle from the Mac's Place Quartet. But whereas Mac is very much in the hardbitten, cynical, world-weary gumshoe mould (despite not actually being a gumshoe), St. Ives is rather more sophisticated and cultured. He seems quite happy pootling about in-between jobs doing not much of anything, and when he's working he is, as he mentions more than once, both cautious and careful. 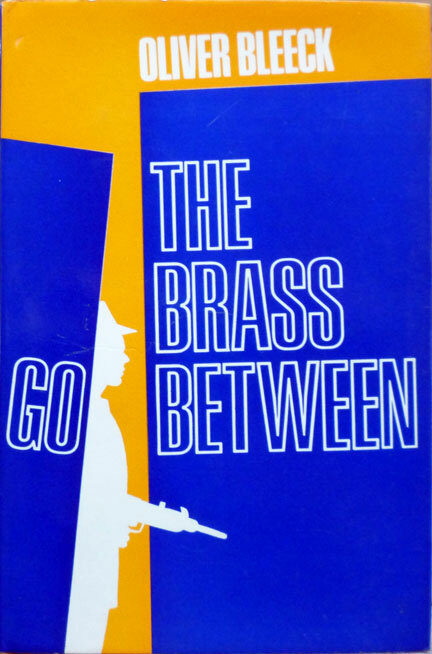 He's not by any stretch of the imagination a thrillseeker... and yet as the plot of The Brass Go-Between becomes ever more complex, in true Thomas fashion, with double-crosses and hidden agendas aplenty, St. Ives soon finds himself in real danger and forced to make a moral choice between doing his job and doing what's right. Mind you, in a Ross Thomas novel, doing what's right is never that clear cut, and after a climactic shootout, St. Ives is left pondering whether he made the correct choice – or even if there was a correct choice to begin with. It's this moral ambiguity that makes Ross Thomas's characters so compelling, from the aforementioned Mac and his partner Mike Padillo, to affable grifters Artie Wu and Quincy Durant, and Philip St. Ives is another name to add to that agreeable list. 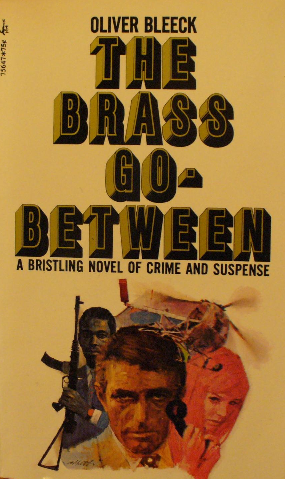 It's just a shame The Brass Go-Between and the rest of the Bleeck novels have fallen out of print, although fairly cheap paperbacks can be found readily on the likes of Amazon Marketplace and AbeBooks. 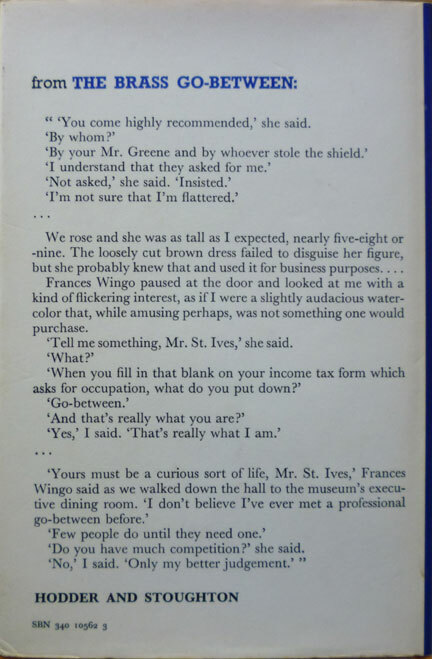 Early in Protocol for a Kidnapping, St.Ives makes a direct reference to his recent African shield fiasco (which means the first book, The Brass Go-Between). That makes Protocol the clear number two. And in early in The Procane Chronicle, St.Ives makes a direct reference to having recently been in Yugoslavia - which is where Protocol for a Kidnapping is set - making Procane number three. So even though Protocol and Procane were both written in 1971, it seems logical that Protocol came first. I can't exactly remember how I figured it out before I read the books. I think I found newspaper reviews of Protocol published before reviews of Procane.